The other day I was playing around with my magnetic polishes. I bought my (sadly only) bottle of the L'oreal Star Magnets years ago(7?8?) before I got into nail polish. I got the agnes b. one from the sweet Kesha over at Nail Polish Obsession. And if you follow me on Twitter, you might read that I stumbled across the magnetic ones from Alessandro. 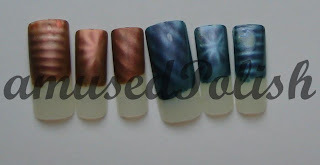 All of them are opaque in one coat and you have to work quickly because the pattern might not show up as you hoped (i.e. the contrast is not as strong as you wished,...). Another thing is that you should be carefull with the magnet. 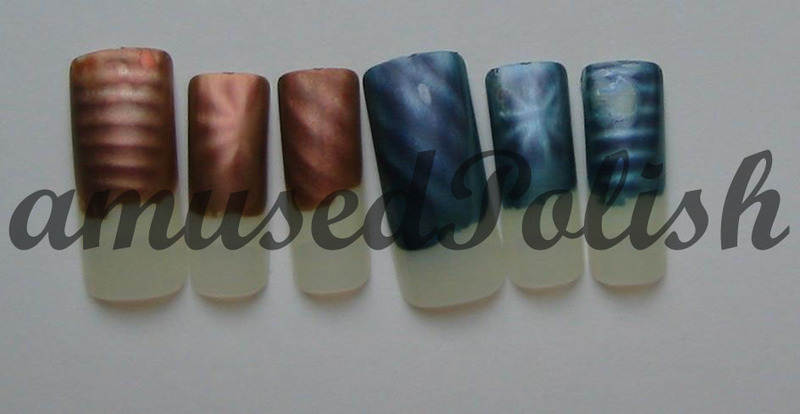 You can see in the pictures later, that you'll get polish on the magnet and it'll ruin your manicure. To avoid this, I'd suggest to place the magnet in a horizontal angle. About the magnets: I liked the one from Alessandro best- you can adjust the height (or what do you call that?, the picture below shows it) of the magent. 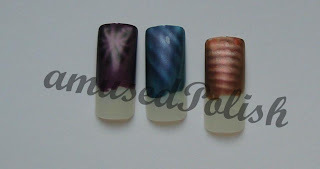 The other two are quite the same- but I wish the pattern of the one from L'oreal would be a tad bigger. My other complaint about the magnet is, that the one from L'oreal is that it is fixed and you can't detach it to make it easier to make the pattern. I know Essence is comming out with some magnetic polishes next month too but I haven't seen/bought them. Alessandro's Blue Chip (BC) has a purple shimmer wich you can best see in the promo picture and you can see it in the darker stripes of it at some angles. Magnetic Prune is as the name implides, a prune color. Cuivre Rose (CR) is a warm copper shade. And lastly, I played around with CR and BC and the other two magnets. As you can see, it works with different magnets too and somehow I think that the one from Alessandro has the most magnetic particals (or the substance that causes the effect). It may only be that the darker color pops out more. Teaser: How about a little army of Nfu.Oh's?